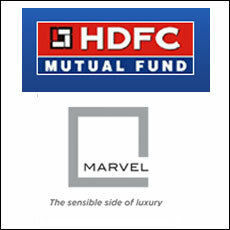 HDFC PMS, an arm of the HDFC Asset Management Company or HDFC AMC, has exited its four-year-old investment in a string of projects by Pune-based real estate developer Marvel Realtors for Rs 152 crore ($23.9 million), clocking an internal rate of return (IRR) of 20 per cent, the company said in a statement. While the company did not share how much money was invested by HDFC, it is estimated it had put in Rs 80 crore almost four years ago. The investment had gone towards a clutch of residential projects and one commercial unit. This was the second investment of HDFC PMS with the realtor. It had exited its earlier investment back in 2012 for Rs 98 crore, clocking an internal rate of return (IRR) of 25 per cent in one-and-a-half years. The company claims to have given profitable exits to four (including HDFC PMS) private equity investors—ICICI Prudential AMC, Capital First and Och-Ziff Capital—since the beginning of this year, totaling Rs 712 crore. The developer currently has 40 ongoing projects in Pune with a total of 24 million sq ft under development. It has so far delivered a total of 25 projects in Pune, Goa and Bangalore. On the commercial front, the realtor has projects that will offer over 1 million sq ft of commercial space in future. It claims to have sold 2 million sq ft and delivered around 1.5 million sq ft area in the last fiscal alone. In the last financial year, it clocked sales of Rs 1,000 crore, up by 38 per cent and intends to grow by 20 per cent in the current fiscal, it said. Its current investors include Piramal Fund Management (three portfolios), Och-Ziff Capital (two deals) and ICICI Prudential (one portfolio). Recently, the developer raised Rs 142 crore ($23 million) from IIFL Wealth Management, a unit of financial services firm India Infoline, through non-convertible debentures. The company had used part of the proceeds from the fundraise for redeeming optionally convertible debentures held by ICICI Prudential PMS and the balance for working capital and general corporate purpose. Even though sales have been slow on a broader level, Pune realty market has proved to be an outlier with better performance on sales volume and inventory level. A good amount of private equity money has flowed into the city on the back of healthy indicators. Recently, Essel Finance invested roughly Rs 100 crore across projects of Pinnacle Group.